Swiss researchers have succeeded in measuring changes in strong magnetic fields with unprecedented precision, they report in the open-access journal Nature Communications. The finding may find widespread use in medicine and other areas. 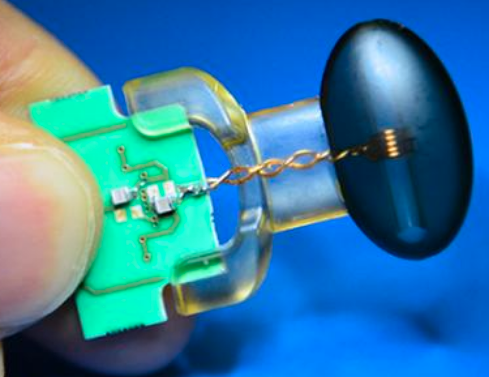 In their experiments, the researchers at the Institute for Biomedical Engineering, which is operated jointly by ETH Zurich and the University of Zurich, magnetized a water droplet inside a magnetic resonance imaging (MRI) scanner, a device used for medical imaging. The researchers were able to detect even the tiniest variations of the magnetic field strength within the droplet. These changes were up to 10-12 (1 trillion) times smaller than the 7 tesla field strength of the MRI scanner used in the experiment. The scientists based the sensing technique on the principle of nuclear magnetic resonance (NMR), which also serves as the basis for magnetic resonance imaging and the spectroscopic methods that biologists use to elucidate the 3D structure of molecules, but with 1000 times greater sensitivity than current NMR methods. The scientists carried out an experiment in which they positioned their sensor in front of the chest of a volunteer test subject inside an MRI scanner. They were able to detect periodic changes in the magnetic field, which pulsated in time with the heartbeat. The measurement curve is similar to an electrocardiogram (ECG), but measures a mechanical process (the contraction of the heart) rather than electrical conduction. The new measurement technique could also be used in the development of new contrast agents for magnetic resonance imaging and improved nuclear magnetic resonance (NMR) spectroscopy for applications in biological and chemical research. In a related development, MIT scientists hoping to get a glimpse of molecules that control brain activity have devised a new sensor that allows them to image these molecules without using any chemical or radioactive labels (which feature low resolution and can’t be easily used to watch dynamic events). In a paper appearing in the Dec. 2 issue of open-access Nature Communications, Jasanoff and his colleagues explain that they used proteases (sometimes used as biomarkers to diagnose diseases such as cancer and Alzheimer’s disease) to demonstrate the validity of their approach. But now they’re working on adapting these imaging agents to monitor neurotransmitters, such as dopamine and serotonin, which are critical to cognition and processing emotions. “What we want to be able to do is detect levels of neurotransmitter that are 100-fold lower than what we’ve seen so far. We also want to be able to use far less of these molecular imaging agents in organisms. That’s one of the key hurdles to trying to bring this approach into people,” Jasanoff says. “Many behaviors involve turning on genes, and you could use this kind of approach to measure where and when the genes are turned on in different parts of the brain,” Jasanoff says. His lab is also working on ways to deliver the peptides without injecting them, which would require finding a way to get them to pass through the blood-brain barrier. This barrier separates the brain from circulating blood and prevents large molecules from entering the brain. Jeff Bulte, a professor of radiology and radiological science at the Johns Hopkins School of Medicine, described the technique as “original and innovative,” while adding that its safety and long-term physiological effects will require more study. The research was funded by the National Institutes of Health BRAIN Initiative, the MIT Simons Center for the Social Brain, and fellowships from the Boehringer Ingelheim Fonds and the Friends of the McGovern Institute. * To make their probes, the researchers modified a naturally occurring peptide called calcitonin gene-related peptide (CGRP), which is active primarily during migraines or inflammation. The researchers engineered the peptides so that they are trapped within a protein cage that keeps them from interacting with blood vessels. When the peptides encounter proteases in the brain, the proteases cut the cages open and the CGRP causes nearby blood vessels to dilate. Imaging this dilation with MRI allows the researchers to determine where the proteases were detected. Another possible application for this type of imaging is to engineer cells so that the gene for CGRP is turned on at the same time that a gene of interest is turned on. That way, scientists could use the CGRP-induced changes in blood flow to track which cells are expressing the target gene, which could help them determine the roles of those cells and genes in different behaviors. Jasanoff’s team demonstrated the feasibility of this approach by showing that implanted cells expressing CGRP could be recognized by imaging. High-field magnets of up to tens of teslas in strength advance applications in physics, chemistry and the life sciences. However, progress in generating such high fields has not been matched by corresponding advances in magnetic field measurement. Based mostly on nuclear magnetic resonance, dynamic high-field magnetometry is currently limited to resolutions in the nanotesla range. Here we report a concerted approach involving tailored materials, magnetostatics and detection electronics to enhance the resolution of nuclear magnetic resonance sensing by three orders of magnitude. The relative sensitivity thus achieved amounts to 1 part per trillion (10−12). 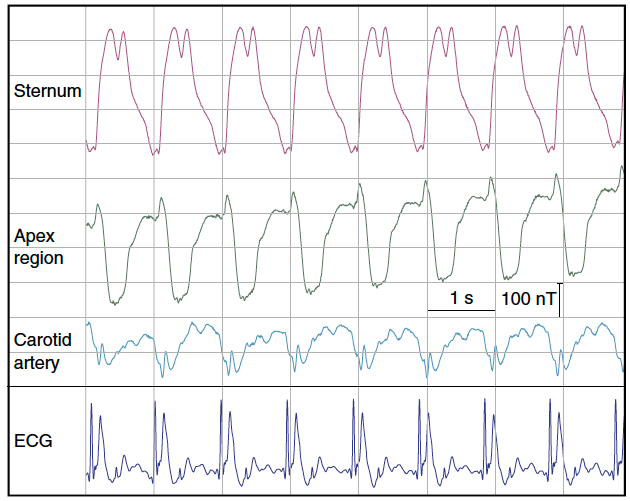 To exemplify this capability we demonstrate the direct detection and relaxometry of nuclear polarization and real-time recording of dynamic susceptibility effects related to human heart function. Enhanced high-field magnetometry will generally permit a fresh look at magnetic phenomena that scale with field strength. It also promises to facilitate the development and operation of high-field magnets. In vivo imaging techniques are powerful tools for evaluating biological systems. Relating image signals to precise molecular phenomena can be challenging, however, due to limitations of the existing optical, magnetic and radioactive imaging probe mechanisms. Here we demonstrate a concept for molecular imaging which bypasses the need for conventional imaging agents by perturbing the endogenous multimodal contrast provided by the vasculature. Variants of the calcitonin gene-related peptide artificially activate vasodilation pathways in rat brain and induce contrast changes that are readily measured by optical and magnetic resonance imaging. 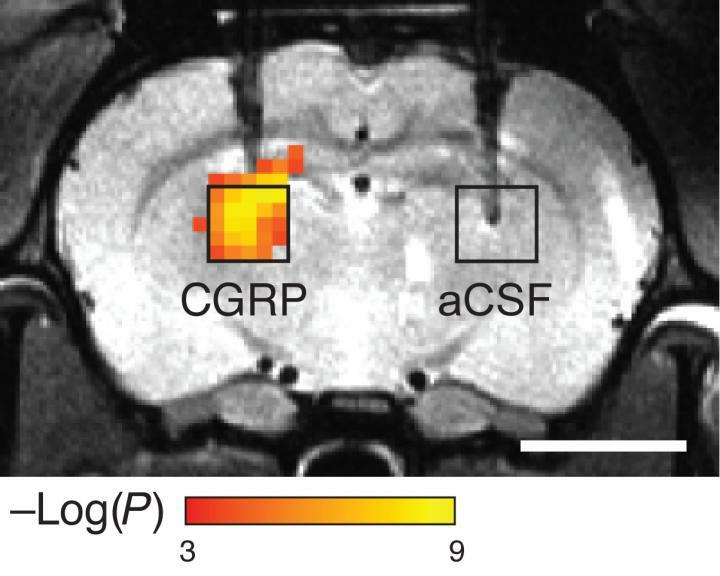 CGRP-based agents induce effects at nanomolar concentrations in deep tissue and can be engineered into switchable analyte-dependent forms and genetically encoded reporters suitable for molecular imaging or cell tracking. Such artificially engineered physiological changes, therefore, provide a highly versatile means for sensitive analysis of molecular events in living organisms.